When I first told my best friend Serena that I was going to become a foster parent for Muttville Senior Dog Rescue she literally laughed in my face saying “there’s no way you’ll be able to give up a dog!” Two years later, I am proud of the nearly one dozen dogs for whom my home has provided a safe haven before passing on to their forever families (or, in the case of my darling Franny, passing out of this world). But last week, Serena’s prophecy finally came true; I found a dog I couldn’t give up. In dog rescue terms, a foster family that ends up adopting their charge is called a “failed foster” – good for the pet, bad for the organization who depends on foster families to rescue dogs from shelters with low resources and high euthanasia rates. Over the last couple of years I’ve run in to a number of people who have told me they “used” to foster or “tried” fostering but just couldn’t let go of the dog they were supposed to care for “temporarily.” I completely understand this. I’ve fallen in love with every single one of my foster dogs – gentle Cassie, spunky Layla, loveable Arkie… And the longer they stay, the harder it becomes to imagine your life without them. I still regret giving up Debbie, the toothless ten pound Pomeranian that lived with me for four months. But there is something about Ginny that is different. She came to me as a skinny, frightened creature. She had big patches of scabs on her back and stomach and a ratty, hairless tail. Deaf, missing half an ear, and dragging her right hind leg, if you had told me three months ago that this was the dog for who would be my fostering kryptonite, I wouldn’t have believed you. 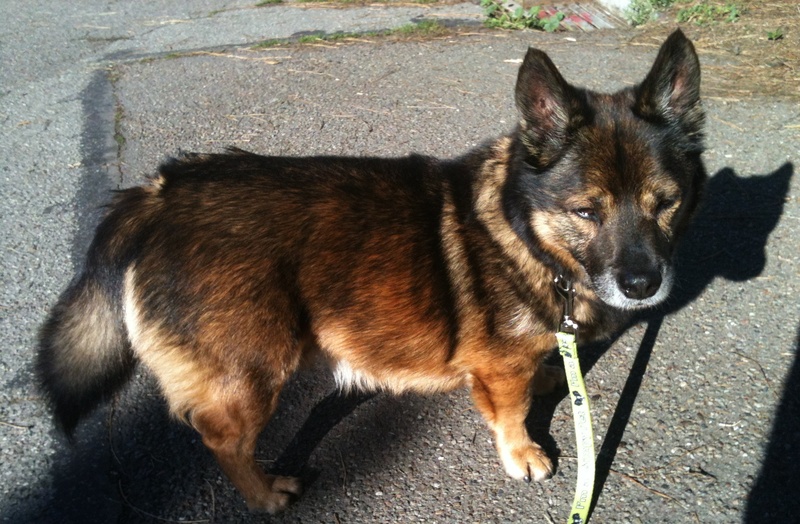 But Ginny has blossomed over the months in to a fluffy and charming little lady. She now knows several commands (taught using hand signals, of course) and is even learning to enjoy the car, a thing she first feared. Ginny is far from perfect – we will be managing her on-leash reactivity issues for the rest of her life – but the thought of her soulful brown eyes looking up at some other guardian just broke my heart… Completely by accident Ginny found her forever home. I failed this time around, I admit, but if my past record is any indication, I have a dozen more dogs to look forward to fostering in the future! It was a beautiful, sunny afternoon as Ginny and I crossed the Bay Bridge headed to Walnut Creek for a Muttville adoption event*. Two different families were interested in meeting my sweet girl and our hopes were high. 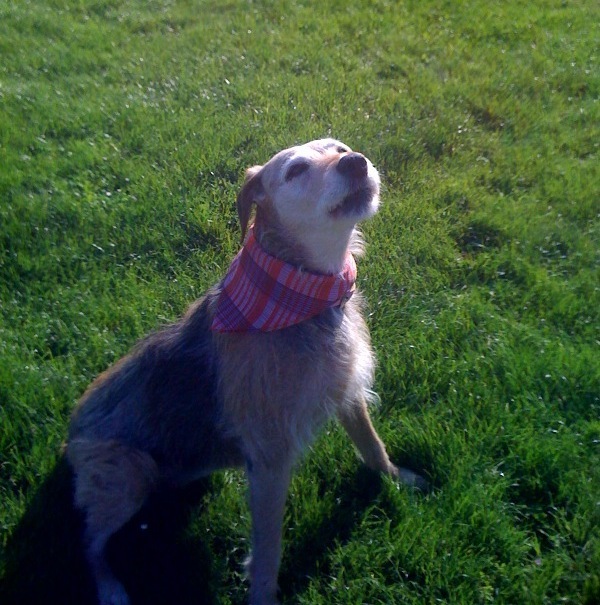 Ok, well Ginny’s hopes were probably at the same level as usual, but mine were soaring – there is never any rhyme or reason as to why some dogs are adopted more quickly than others. At one month and counting, Ginny has been with me longer than any foster dog since Franny. Adoption events are high stress environments for dogs. Many are overwhelmed by the number of unfamiliar furry bodies smooshed together in a small space and each handles this stress differently; some dogs get barky, some become overstimulated and can’t settle down, others prefer to curl up somewhere quiet and ignore the chaos. The most energetic dogs, however, are often those that have not yet visited the vet to be neutered. These new arrivals to Muttville are not just dealing with the excitement and stress of losing their homes but with years of testosterone surging unchecked through their doggie bodies. Dogs like Buddy, a 15-year old Aussie mix that arrived at Muttville this week from a broken home and a history of neglect, spend the adoption event trying to get close to the eligible ladies and posturing around the more high-strung males. Muttville, like nearly all rescue organizations and shelters, spay and neuter their pets prior to adopting them out. In part, this is to slow down the cycle of dogs producing puppies that eventually turn in to unwanted dogs that wind up right back in the shelter. But neutering and spaying is not to stem the tide of needy dogs, it also has health and behavior benefits. 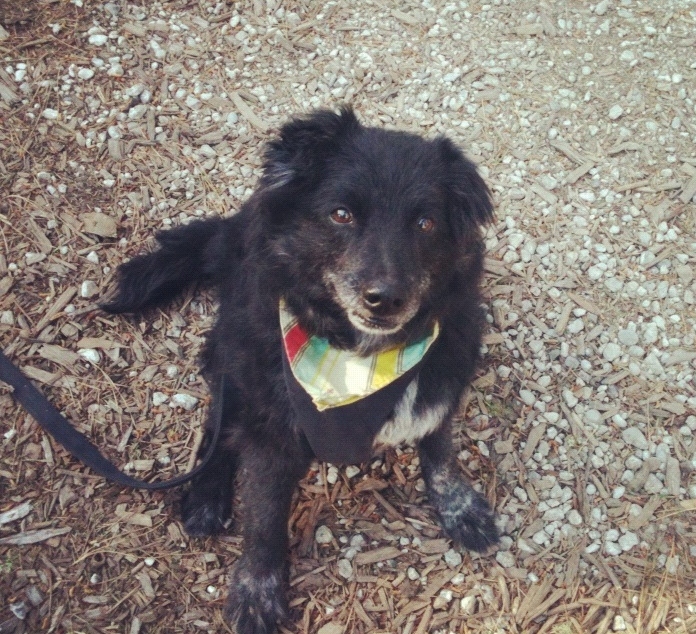 Buddy is available for adoption at Muttville Senior Dog Rescue. In male dogs, the second leading form of cancer is testicular and enlargement of the prostate effects 60% of intact males over the age of five. The most common malignant tumors in female dogs are found in the mammary glands. It is more than three times more likely that an unspayed female will develop mammary cancer than a spayed female. The strong desire to roam to find sexual partners in both male and female dogs is also greatly decreased by spaying and neutering. In urban and suburban environments, dogs that roam are much more likely to be wounded or killed by cars than those that stay put. Spaying and neutering can decrease wanderlust but up to 90%! And then there is the matter of behavior. Neutering and spaying has not been proven to decrease play, activity or the desire for affection and attention. It has, however, been proven to decrease aggression and behaviors such as mounting which can quickly deteriorate from play to fight. It also decreases inappropriate peeing such as excessive marking. There are very few risks associated with spaying and neutering adult dogs**, besides the unavoidable risk of the anesthesia the dog receives to undergo the surgery. Since breeding becomes dangerous for females over the age of 8, spaying may curb the slew of potential problems that could arise there, as well (such as ruptured uterine walls). Once spaying and neutering in an adult is complete, it will take a few weeks for testosterone and estrogen levels to drop and, during that time, your dog may continue to display intact behaviors like wandering and mounting. A dog is essentially never too old to reap benefits from spaying and neutering. And if it’s the look of an intact male dog you worry about losing, check out neuticles – prosthetic testicular implants made just for dogs! *Muttville holds a monthly adoption event at Pets Unlimited in Walnut Creek. Visit Muttville or Pet Food Express for more information on dates and times. **There is some evidence that neutering a dog too young leads to health problems that may include distorted bone structure, hyperthyroidism, and obesity, though not all veterinarians agree that there is a link. Last night, Franny lay her head on my knee and passed from this world. When Franny violently vomited on Friday morning, I assumed it was something gross she ate. 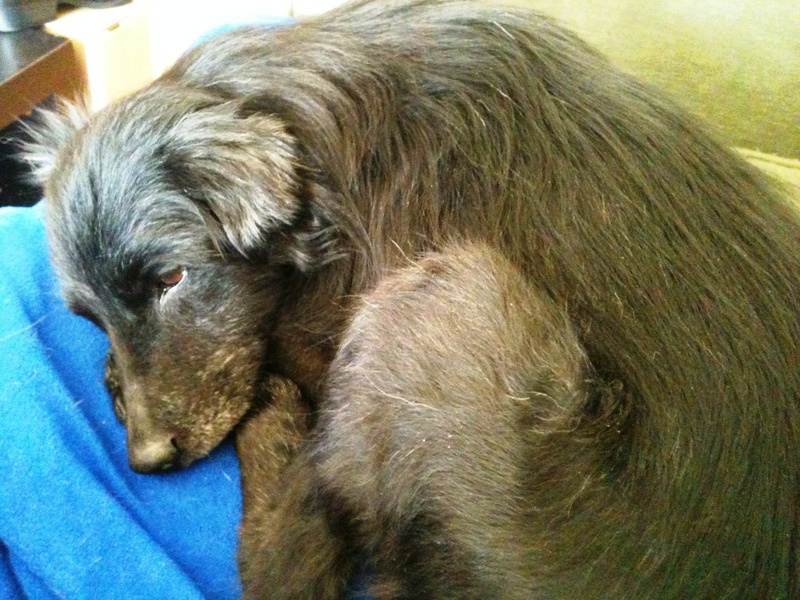 She had eaten only half of her breakfast – fairly unusual for her – and I figured she must be feeling pretty nauseous. We went for a walk in the neighborhood around 11am and Franny moved slowly. Her cropped tail which she usually holds high and wags was low and still. I left Franny for 90 minutes to walk another dog and when I returned she was laying by the front door waiting for me. I pulled out the remaining cheese from my treat-bag and offered it to her. She took the cheese I held out but when I dropped the remaining pieces in her food bowl she walked away from it. I turned from her food bowl and realized the whole floor of the kitchen was covered in vomit. An hour or two later, she walked in to the backyard, vomiting again. The last week or so Franny’s shaking had increased. She would occasionally get shaky – sometimes before a meal or when she first woke up in the morning – but it was now coming much more frequently. On Friday she shook all day. When dinner time rolled around I offered Franny some plain white rice and cottage cheese, a combination vets recommend when dogs have digestion problems. She didn’t touch the food and when I took her out for a walk in the evening, she looked at me questioningly, standing at the top of the stairs of my building, then slowly made her way down. Once outside she just stood there. I coaxed her on and she took a few steps and stopped again. A few more steps and stops later, we turned and headed back home; we hadn’t even made it half a block to the end of the street. After our walk, Franny couldn’t get comfortable. She was restless, getting up and standing awkwardly for several minutes at a time then laying down again, shifting around and shaking. I made a painkiller meatball for her and hoped it would help. When I offered her treats later that evening she ignored them. The next morning was the same. I offered Franny another painkiller meatball and the remaining wet food I had, feeding it to her by hand. She ate the food and, bolstered by this slight improvement, I pulled out the cottage cheese, digging out bits with my fingers and giving it to her. After a few bites, she turned and walked back to her bed. Our attempt at a walk went much the same as it had the night before. Franny showed no interest in this activity which she adored; we didn’t get more than 50 meters from the house. In the afternoon I called the 24-hr veterinary hospital at Pets Unlimited. I asked them “how do I know when it’s time?” They suggested I bring Franny in so I could consult with the vet. I called my dear friend Mark who has always been there for me in times of need and asked if he would come to help and he immediately agreed. At 6pm we drove Franny to the vet and they had a private room ready for us. Dr. Villard joined us and asked me to recount the last 36 hours. I told him I was terrified that I was making this decision too early but more terrified that she might suffer. He said that what I was describing suggested to him it was the end – the increase in shaking was pain, the vomiting and refusal to eat was a tumor obstructing her organs (in stomach cancer, tumors will either burst causing blood in the urine and vomit or will grow to block normal functions). Dr. Villard told me that, though this was a personal choice, he, himself, would rather err on the side of early euthanasia than have the animal in deep pain. I found myself agreeing. For the last five months, I have done everything I could to make Franny’s last chapter the best it could be; to let her suffering increase would betray that effort. At 6:45pm, Dr. Villard brought the lethal cocktail. I sat on the floor next to her, stroking her side as Dr. Villard injected the solution in to a catheter they had inserted in her front paw. As the drugs entered her body, Franny stretched her neck and we gently guided her head to my lap. Less than a minute later, Franny’s heart had stopped beating. She was gone. Cassie had to be completely shaved down to remove horribly matted fur. Layla was adopted on Saturday night by a lovely young woman, Devi Feerick, who swooped her through the rain to her new home in Petaluma. Layla will join her new family – a 12-yr old Bichon, a kitty, mom and dad – to begin the rest of her life. All rescue organizations and shelters charge fees for adoption that typically begin around $200; fees for puppy adoption can be much higher. So where does all that money go? 1) Grooming. Basic grooming can be done without a problem by rescue staff or foster parents but some dogs are pulled off the street or out of abusive homes in need of much more than just a brushing. 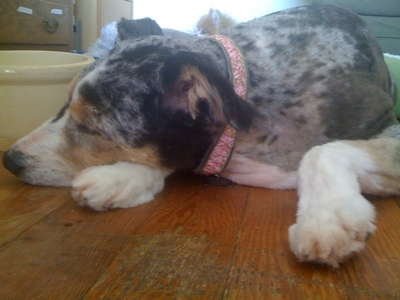 Cassie, a beautiful Australian Shepherd I fostered in April, was so matted they had to shave her down completely. 2) Spaying and neutering. All responsible shelters and rescue organizations will spay or neuter the dogs they take in before they allow them to be adopted. This helps to cut down on the population of dogs in need of rescue. It also cuts down on potential health problems as the dog ages. 3) Vaccinations. All dogs are vaccinated prior to adoption to protect them from illnesses like rabies. 4) Dentistry. I have had several foster dogs with terrible, infected teeth in need of care. Debbie, a Pom I had last year, had to have all of her teeth removed because they were so terrible, turning her in to a gum smacking old lady…but a cute one. 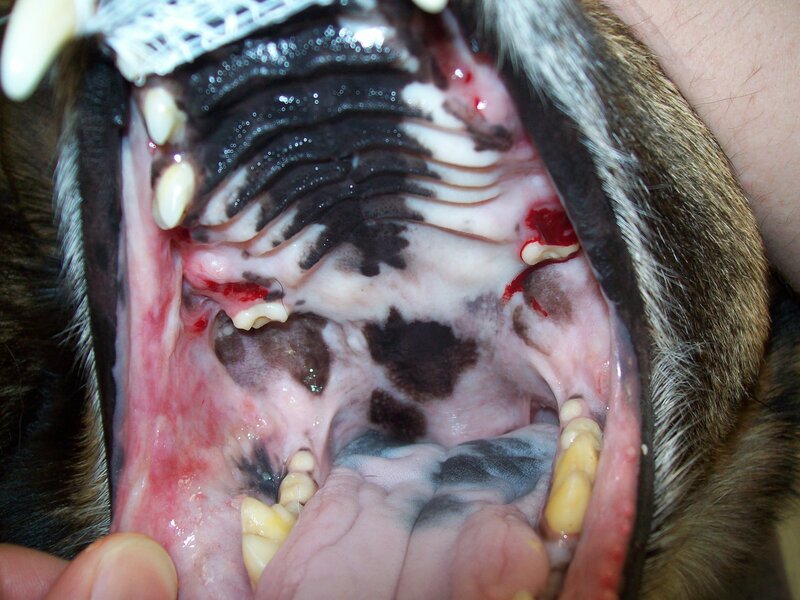 Animal dental care is ridiculously expensive – just a cleaning can be upwards of $300-400 – not to mention extractions. 5) Basic health care. In addition to all of these specifics, dogs that filter through shelters and rescue organizations often have health issues that range from worms to cancer. It is not unusual for a shelter/rescue to remove a limb to prevent the spread of cancer or to begin a dog on a long-term medical treatment for a permanent condition. And then there are the hospice dogs, like Franny, whose veterinary care will be taken care of until the end. 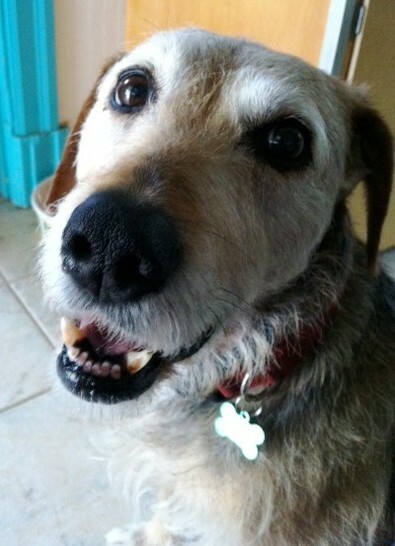 In fact, if I needed them to, Muttville would also provide Franny with food and other basic necessities. Any time we pass by Muttville Manor, we end up with a trunk full of treats and other goodies that have been generously donated to the organization. 6) Day-to-day upkeep. This is more of an expense for shelters than rescues (although many rescues also keep several dogs at a time at their headquarters) that provide food, soft beds, toys, treats, and other necessities to keep their dogs as comfortable as possible. In most cases, the $200 (or other similar fee) charged to adopters only begins to cover the expenses racked up by the dogs they rescue. So if it seems like a lot, remember that you are paying for the opportunity to adopt a healthy animal that (hopefully) will not have to return to the vet until its next check-up is due!